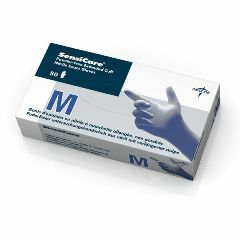 SensiCare non-sterile powder-free nitrile exam gloves are textured throughout. Blue gloves have an extended cuff for extra protection. AllegroMedical.com presents The SensiCare Extended Cuff Nitrile Exam Gloves. SensiCare non-sterile powder-free nitrile exam gloves are textured throughout. Blue gloves have an extended cuff for extra protection. Not made with natural rubber latex.